Under the dedicated and inspiring leadership of its founder and managing director, Baphumelele Children’s Home cares for abandoned and orphaned children affected by HIV/AIDS in the township of Khayelitsha, Cape Town. The organization began through the vision of one person, Rosie Mashale. A teacher by profession, she saw the neglected and abandoned children in her community and decided to take action. Within one week, she was caring for thirty-six children. 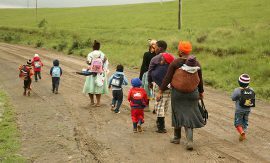 From there, with the help of other women in her community, the Baphumelele Educare Centre was born. Based on the Waldorf educational model, the crèche (pre-school) now serves well over two hundred children from infants to six years old. Novel in its approach, Baphumelele began building cluster homes to provide housing for the children in a small, more intimate family-like setting. Each home, which houses six to eight children and two parental figures, functions like any home, with shared meals, homework time, bedtime stories and family activities. This model, a relatively new concept in South Africa, is in contrast to the traditional institutionalized setting of large, dormitory style living spaces. True to its name, the Xhosa word, “progress”, Baphumelele is continually expanding its services and programs in response to community needs. In addition to its homes and crèche, Baphumelele operates a Respite Care Centre for HIV positive adults, which houses and cares for seventeen adults, a Woodwork Shop and Rosie’s Kitchen, which offers nutritious and affordable lunches to the community. Between fifty to eighty people are served lunches daily for R2 (30 cents).